A day devoted entirely to exploring the magical island of Capri starting with a pick up from your hotel, or established meeting place, for a transfer to the port of Sorrento and a 20 minute or so ferry crossing to Capri. 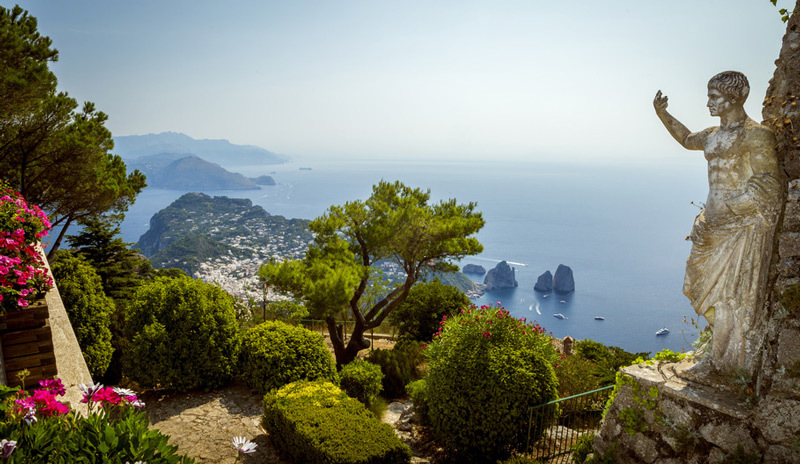 A minibus takes you up to the beautiful village of Anacapri, above Capri, where free time allows you to explore the shops with their wide variety of typical products and clothing, have lunch or visit the famous Villa San Michele. Nature and landscape lovers may decide to get the chair lift that goes to the summit of Monte Solaro, the highest point of the island at 600 metres. You continue the tour by descending to the famous “Piazzetta” of Capri, meeting place of VIPs and a vantage point of great beauty. There you have free time for shopping amongst the exclusive boutiques or go for a short walk to the Gardens of Augustus with breathtaking views before returning to the port at Marina Grande. If time and weather permits, you can enjoy the beauty of the coast of the island with a boat ride or visit the Blue Grotto which is known throughout the world for its size, and for its intense blue and silvery white water. After this wonderful tour of the Capri you return to the port of Sorrento and subsequent transfer by minibus to your hotel by late afternoon. Villa San Michele entrance fee € 11.00. Visit to the Blue Grotto. Lunch is not included in the price of this excursion.